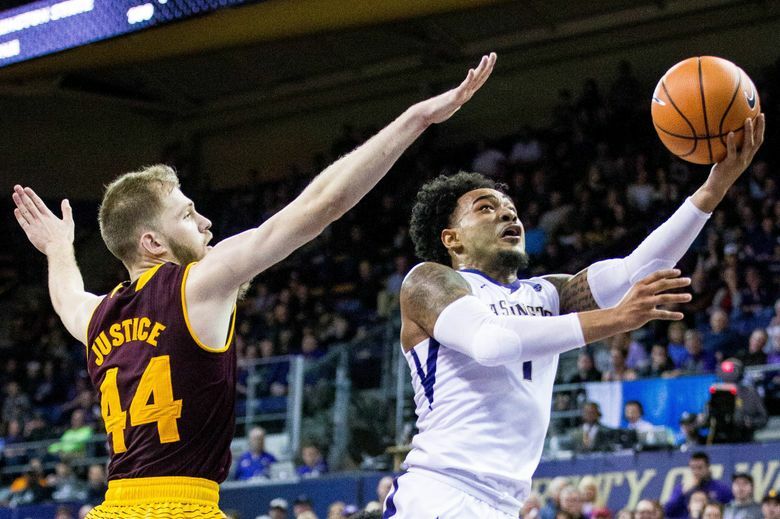 The Huskies are going for their 13th straight win at Arizona State, which is reeling from a surprising defeat on Thursday to Washington State. Records: UW (19-4, 10-0): Arizona State (15-7, 6-4). Scouting report: With 12 straight wins, Washington has the third longest active winning streak among Division I teams behind Tennessee (17) and Gonzaga (13). … The Huskies’ 10-0 start is its best in the conference since the 1952-53 season and tied for the fifth best in the league since it switched to an 18-game schedule in 1978-79. … Washington beat Arizona 67-60 at McKale Center on Thursday. … Against the Wildcats, the Huskies relied on a makeshift lineup that included backup guard Dominic Green and forward Sam Timmins. … Forward Noah Dickerson, who sprained his right ankle last week, came off the bench on Thursday and finished with 10 points. … Forward Hameir Wright didn’t play Thursday due to illness. … Arizona State fell flat during a 91-70 upset loss to Washington State on Thursday. … Sun Devils freshman forward Taeshon Cherry (concussion) is out. … Sophomore forward Romello White left the game against WSU in the second half with a leg injury and did not return. … ASU sophomore guard Remy Martin missed practices early this week due to an ankle injury and Zylan Cheatham skipped Monday’s workout due to strep throat. … ESPN2’s Dave Pasch and Bill Walton will provide commentary for Saturday’s game. Key matchup: Luguentz Dort is ASU’s leading scorer at 16.2 points per game. The freshman guard isn’t a great three-point shooter (27.9 percent), but for some reason he has a green light to shoot at will and leads the Sun Devils in 3-point attempts (111). Dort scored 22 points Thursday, but in the previous games he was 2 of 16 on 3-pointers. Coach: Bob Hurley is 61-52 in his fourth year at ASU. He compiled a 42-20 record during a two-year tenure (2013-15) at Buffalo. Hurley has a 103-72 overall coaching record. The series: Washington leads 44-39. … The Huskies are 11-13 in the past 14 meetings. … UW is 5-1 in its past six trips to Arizona State. Last meeting: Dickerson scored a game-high 21 points to lead Washington to a 68-64 win over Arizona State at Alaska Airlines Arena on Feb. 2, 2018. … Neither team led by more than four points in the final 14 minutes. The Huskies sank 8 of 8 free throws in the second half and David Crisp (12 points) made a couple of clutch baskets down the stretch. … Jaylen Nowell had 16 points and nine rebounds. … Washington led for more than 32 minutes.